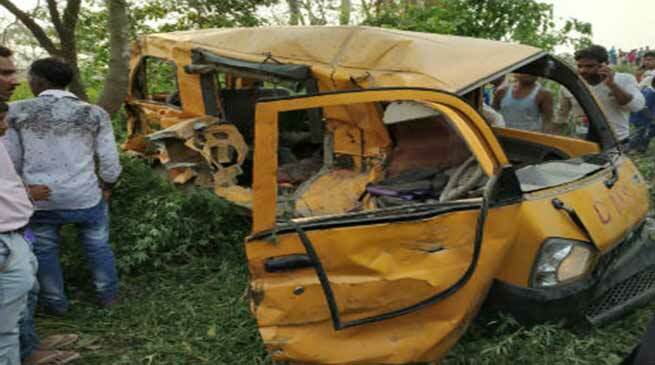 In a tragic incident, 13 school students were killed and 8 students were injured after the school bus they were travelling is collided with a train at an unmanned rail crossing in Dudhi near Kushinagar town of Uttar Pradesh . According to the report the Chief Minister Yogi Adityanath has expressed his deepest condolences on this very unfortunate incident and directed District Administration to provide all help & medical aid. He has even declared an ex-gratia of Rs 2 lakhs and has ordered for an inquiry into the cause of the accident. Earlier this month, more than 27 school children were reported dead after a bus ferrying them fall into a gorge in Himachal Pradesh’s Kangra district. The accident was reported from Nurpur area in Kangra, where a private bus ferrying 40 school students skidded off the highway and plunged into a deep gorge. The children, enrolled in the Wazir Ram Singh Memorial School, were being dropped back home when the accident occurred.